KENNETT SQUARE, Pennsylvania - For the first time, U.S. public schools are projected this fall to have more minority students than non-Hispanic whites, a shift largely fueled by growth in the number of Hispanic children. The changing demographics of American education are apparent inside Jane Cornell's summer school classroom in Pennsylvania's wealthiest county, where giggling grade-schoolers mostly come from homes where Spanish is the primary language. The sign outside the classroom reads "Welcome" and "Bienvenidos" in polished handwriting. Non-Hispanic white students are still expected to be the largest racial group in the public schools this year at 49.8 percent. But according to the National Center for Education Statistics, minority students, when added together, will now make up the majority. About one-quarter of the minority students are Hispanic, 15 percent are black and 5 percent are Asian and Pacific Islanders. Biracial students and Native Americans make up an even smaller share of the minority student population. The shift brings new academic realities, such as the need for more English language instruction, and cultural ones, such as changing school lunch menus to reflect students' tastes. But it also brings up some complex societal questions that often fall to school systems to address, including issues of immigration, poverty, diversity and inequity. The result, at times, is racial tension. In Louisiana in July, Jefferson Parish public school administrators reached an agreement with the federal government to end an investigation into discrimination against English-language learners. In May, police had to be called to help break up a fight between Hispanic and black students at a school in Streamwood, Illinois, a Chicago suburb, after a racially-based lunchroom brawl got out of control. Issues of race and ethnicity in schools also can be more subtle. In Pennsylvania's Kennett Consolidated School District, Superintendent Barry Tomasetti described parents who opt to send their kids to private schools in Delaware after touring diverse classrooms. Other families, he said, seek out the district's diverse schools "because they realize it's not a homogenous world out there." The changes in the district from mostly middle-to-upper class white to about 40 percent Hispanic was in part driven by workers migrating from Mexico and other countries to work the mushroom farms. "We like our diversity," Tomasetti said, even as he acknowledged the cost. He has had to hire English-language instructors and translators for parent-teacher conferences. 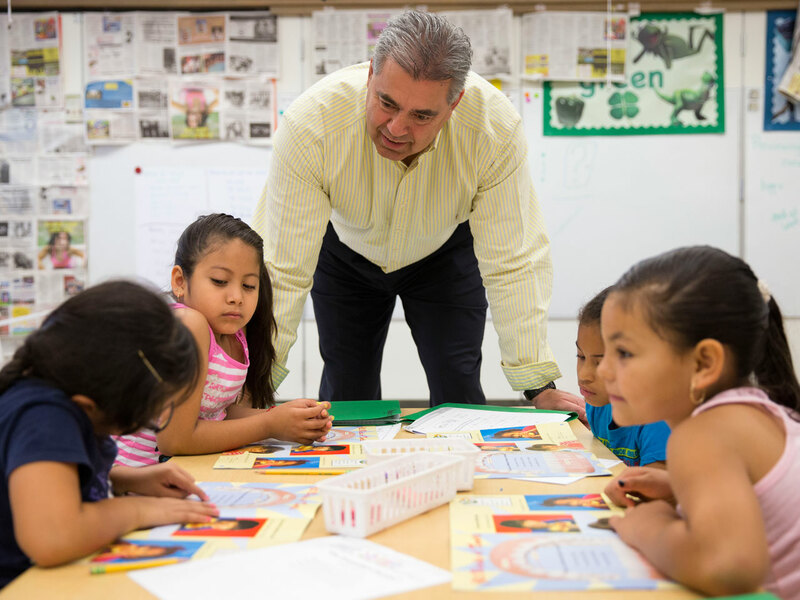 He has cobbled money together to provide summer school for many young English-language learners who need extra reading and math support. "Our expectation is all of our kids succeed," he said. The new majority-minority status of America's schools mirrors a change that is coming for the nation as a whole. The Census Bureau estimates that the country's population also will have more minorities than whites for the first time in 2043, a result of higher birth rates among Hispanics and a stagnating or declining birth rate among blacks, whites and Asians. Even as the population becomes more diverse, schools are becoming more racially divided, reflecting U.S. housing patterns. The disparities are evident even in the youngest of black, Hispanic and Native American children, who on average enter kindergarten academically behind their white and Asian peers. They are more likely to attend failing schools and face harsher school discipline. Later, they have lower standardized test scores, on average, fewer opportunities to take advanced classes, and are less likely to graduate. As the school age population has become more nonwhite, it's also become poorer, said Patricia Gandara, co-director of the Civil Rights Project at UCLA who serves on President Barack Obama's advisory Commission on Educational Excellence for Hispanics. Roughly one-quarter of Hispanics and African-Americans live below the poverty line - meaning a family of four has nearly $24,000 in annual income - and some of the poorest Hispanic children are dealing with the instability of being in the country illegally or with a parent who is, Gandara said. Focusing on teacher preparation and stronger curriculum is "not going to get us anywhere unless we pay attention to the really basic needs of these children, things like nutrition and health and safety, and the instability of the homes," she said. This transformation in school goes beyond just educating the children. Educators said their parents also must feel comfortable and accepted in schools.